Join in on a fantastic Maya adventure! This year, join us on an exciting Maya adventure to witness the Maya past and present. With John Major Jenkins, author of Maya Cosmogenesis 2012 and Galactic Alignment, and Jim Reed, current editor of the Institute of Maya Studies newsletter and past president of the Institute (2000), as your guides, you'll get to experience ancient Maya sites and the living Maya as never before. You will be picked up at the airport when you arrive on Saturday, July 28, and we will spend the first night in a nice hotel in Zona Viva. The next day we take our air-conditioned bus eastward to Honduras. Crossing the border, we arrive at Copán and stay at the beautiful Hacienda San Lucas. The entire next day (Monday) is devoted to Copán, and we stay another night at Hacienda San Lucas. Copán has more sculpted monuments and hieroglyphic inscriptions than any other Maya site. The recreated inner temple of Rosalila, colorful and ornately sculpted, is in the amazing Copán Museum and is unprecedented in the Maya world. It looks like we will also have the great opportunity to meet with archaeologist David Sedat, who was involved in the discovery of the tombs underneath the Rosalila, and he will show us a slide program. On day 4 (Tuesday) we return through Guatemala City to Antigua, the beautiful old colonial capitol. (On the way, if time permits we will stop either in Esquipulas for lunch and visit the cathedral of the Black Christ or visit the ruins of the pre-Classic metropolis, Kaminal Juyú). We will have the evening in Antigua on day 4, and next morning (Wednesday) we get a tour of Jades S.A. In the 1970s, Mary Lou and Jay discovered the lost jade quarries of the ancient Maya, in eastern Guatemala. Thereafter, they pioneered the recovery of jade sculpting arts and employed Maya artisans in the creating of beautiful works of art. Their store and workshop in Antigua is a block away from the portada of La Concepcion convent, which John Major Jenkins wrote about in his 2002 book Galactic Alignment. Throughout the trip, John will provide background information on the various sites and will answer questions. That afternoon we hit the road and travel to Chichicastenango in the Highlands; along the way we'll take a look at the Conquest-era Maya site of Ixim'ché. Our Wednesday evening in Chichi will be time to have dinner at the hotel or explore the town. On Thursday morning, we experience Market Day in Chichi! Come prepared for a colorful carnival of goods. By late afternoon we will be trundling down to the incredible shores of Lake Atitlán, a short distance from Chichi. We'll stay at comfortable cottages on the Santiago side of the lake. On Friday we will seek out the Tzutujil Maya deity known as Maximón  a strange blend of Maya and Christian worship that John will explain. That evening (Friday) we will overnight in Retalhuleu in preparation for our visit to a little-visited pre-Classic site called Tak'alik A'baj. John believes it is a sister-city to the site of Izapa, which lies fifty miles to the west in Mexico. These sites were astronomical observatories, and the cosmology pioneered addresses certain mysteries about the Maya calendar end-date, December 21, 2012. We will have a chance to speak with the site supervisors at Tak'alik A'baj, archeologist Miguel Orregocorzo and licensed archeologist Christa Schieber de Lavarreda. After spending Saturday afternoon there, we'll zip along the Panamerican highway back to Guatemala City. On the way we will visit Olmec sculptures in the town of La Democrácia. A final Saturday night in Antigua, we gather our thoughts and share our experiences. Sunday fly outs, or travelers depart for other destinations. This is an economically priced adventure with authors and experts. Cost: $1050. Meals are not included, except for breakfasts. 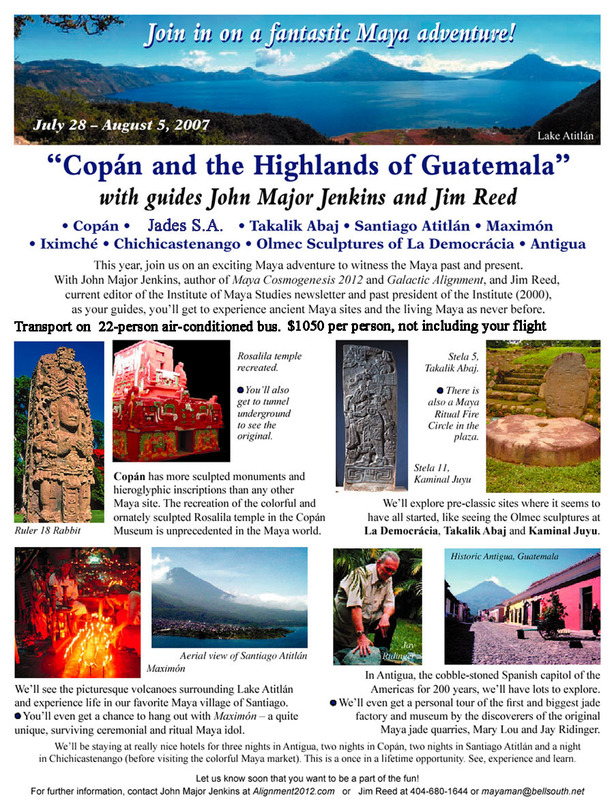 You are responsible for your roundtrip airfare to Guatemala City. It's best to arrange your flight as soon as you decide to go. Please send a $300 down payment by May 25 to ensure your space. Full balance is due by July 15. The adventure begins July 28! You will be taken to a screen where you can enter your name and contact information.